Interesting characters, in an interesting setting, with solid prose. This was an easy read, and while long it didn't feel long while reading it. The ending felt a bit sudden and jolt-y, and unsatisfying, with the plot being a bit confusing and disjointed- but there are still two other books to see it through! The Mongoliad by Neal Stephenson, Erik Bear, Greg Bear, Joseph Brassey, Nicole Galland, Cooper Moo and Mark Teppo is a three-part series set in a fictionalized past, and it is deliciously massive epic tale of historical fantasy. We’ve got sweeping plains and deep, dark forests, crypts and the crumbling remains of castles, and an absolutely diverse cast of badass characters from a variety of cultures and nationalities. The writing is well-researched, and detailed without becoming overly lush with adjectives or poetics, giving just the right amount of detail to allow your mind to go wild. The variation in viewpoints is refreshing, with each character’s experiences and beliefs coloring how they perceive things; leading to a multi-chapter battle told in alternating pieces by each of the combatants, both of whom are from very different cultures. When meeting someone from a culture that is totally foreign to your own, it is very easy to demonize them, and that is before combat is involved! My only real gripe with book one was how suddenly it ended. It didn’t feel like a book complete in of itself; it is very much a part of a larger whole. The sudden ending is a decent hook to the next part of the journey, but it also gives a bit of a sour note to the finishing. There’s very little sense of completeness or accomplishment, for all that the characters have done, and massive amounts of unfinished plot threads and new information in the last few chapters as well. At eight hours reading and 502 pages, it’ll keep you busy for a while, and without hitting those dragging chapters some long books tend to have. The characters are lively, the story paced at a jaunty clip that makes the time fly by, and the book dreadfully hard to put down. 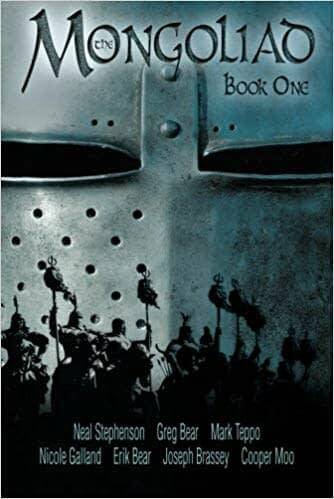 If you’ve enjoyed massive epics such as the Song of Ice and Fire by George R. R. Martin, or The Tales of the Black Company by Glen Cook, this is another series that will find a good home on your shelf or e-reader.